3 Ways to Play Walker - Ford F-150 Raptor, Shadow Black is rated 4.9 out of 5 by 9. Your baby has never looked cooler than behind the wheel of this lifelike Ford truck. Rev your engine and get ready to put the pedal to the playtime metal! 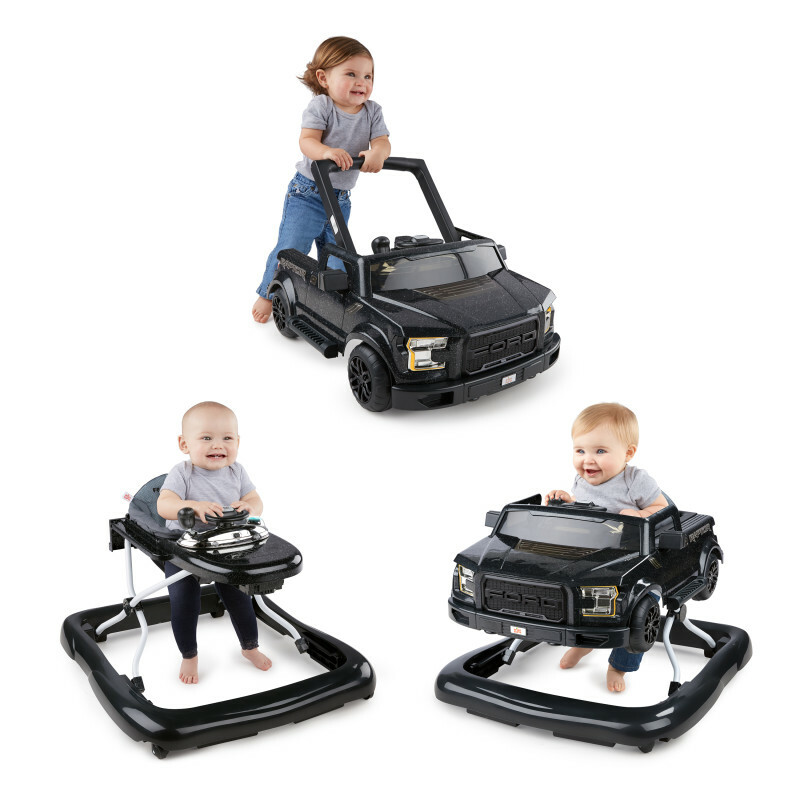 When you need fun in high gear, this baby walker is the perfect pick-up truck for the job. The shadow black walker is Built Ford Tough to support multiple stages of play. In normal walker mode, pre-walking drivers can steer around the house with extra stability and support. More experienced walkers can use push-behind mode to “hit the road” inside your home. The authentic truck sounds, lights, gear shifter, steering wheel and the look of this rugged walker will drive your baby’s imagination ("Wow! I'm just like mom and dad!"). The removable steering wheel activity center can be used for floor play or on-the-go. Dimension (in) 28.5" x 25" x 19.7"
Seat Pad – Can be cleaned by sponging with warm water and a mild detergent. (Do not immerse in water.) Never clean with abrasive, ammonia-based, bleach-based, or spirit-type cleaners. Seat pad must be dried thoroughly on a flat surface before using or storing. Do not spin or tumble dry.Plastic Parts – Wipe clean with damp cloth and mild soap. Air dry. Do not immerse in water.Frame – Wipe the metal frame with a soft, clean cloth and mild soap. Rated 4 out of 5 by Lauralc from Great! I love that this walker has other functions. As you may know, babies grow quickly! And it’s not long that they are over the walker and ready for something new so this is absolutely perfect. It’s so stinking cute. Very well built. Rated 5 out of 5 by Mast from Fun for many stages! The 3 Ways to Play Ford Raptor is an excellent choice for parents to purchase for their you g child. It is worth the investment since it is useful at many different stages of learning to walk! I love that the truck portion can be taken off to play with by itself. When this occurs there is also the option of using just the walker without the truck, meaning more than one child can be entertained at a time. The instructions were easy to follow and it was together within 20 minutes. My son loves it! I would recommend this product! Rated 5 out of 5 by CandyHBebe from Cutest ever!!! This was the easiest thing to put together and it’s sooooo adorable! My 8 month old absolutely loves it! Such good quality and a great value!! HIGHLY recommend!!! Rated 5 out of 5 by CaitG from Awesome 3-in-1 Walker My husband and I get a kick out of this new walker. So much fun! Love that it is perfect for a little boy with the interactive steering wheel, gear shift, and horn. My baby loves all of the features and I love that it's so versatile. There is the walk behind setup, a normal walker setup and the walker setup with the car top attached. Assembly wasn't horrible and easily snapped together. The walker is durable and sturdy and has survived many crashes into my walls. It adjusts to my baby's height and holds her in really well. I think this walker is adorable for parents if you don't want a character or "baby" looking walker and only want one item that goes three different ways. Rated 5 out of 5 by Mandee1989 from So fun! This is such a great toy! Love all the different ways you can use it and they ways it will grow with the baby. The quality is great and it is easy to assemble! Rated 5 out of 5 by cait123 from Great toy. So versatile. I like the removable toy station both of my kids can get use of the toy. The older one will push it and the younger one plays with the toy station. Rated 5 out of 5 by momtomany from Many features on this walker This is the ultimate walker! What's great is that you don't just use it for a couple of months and then pack it away, you can continue to use it as your baby grows. This walker is very cute, it's very unique in that it resembles a Ford truck, adorable! There are three different ways to play as your baby grows. There is a normal walker mode, a pre-walking mode and you can remove the steering wheel and can be played with anywhere. The steering wheel does take batteries and there are sounds and lights - very cute. The walker is made very well and seems to be very durable and sturdy. The walker is supportive of baby and also adjustable height. I really love it, you can go wrong with this walker! It's super easy to put together and just snaps into place and stays in place. The seat is removable so it can be washed. I would definitely recommend! Rated 5 out of 5 by kgomez from Exactly what was expected We have a two year old and an 11 week old. We originally got this for the 11 week old to use in a couple of months but our two year old loves pushing it around!